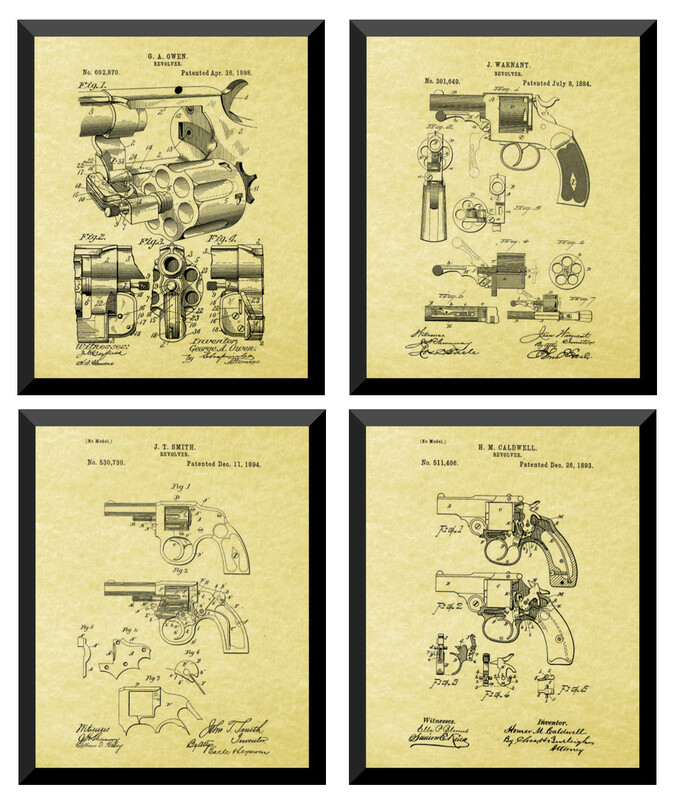 4 Gun Revolver Patents From the Old West, 8" x 10"
These four patents from the late 1800s, which offer improvements to the gun known as the revolver, are part of the rich tradition of the American frontier, often called the 'wild west' or the old west. These four patents from the late 1800s, which offer improvements to the gun known as the revolver, are part of the rich tradition of the American frontier, often called the 'wild west' or the old west. This legendary time began about halfway through the 1800s and officially ended in 1912 when the last frontier state was admitted to the union. 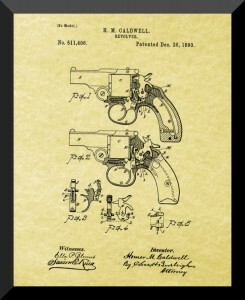 The revolver was carried by the majority of men and these patents from 1884 - 1896 offered improvements to this ubiquitous gun. 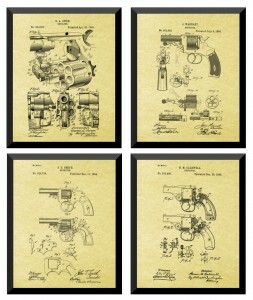 These four patents will be treasured by any historian or gun lover. Patent #1. 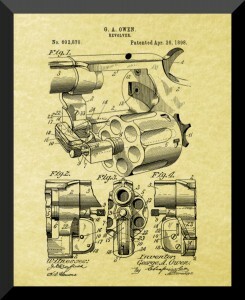 George A. Owen patented this invention on April 26, 1898. 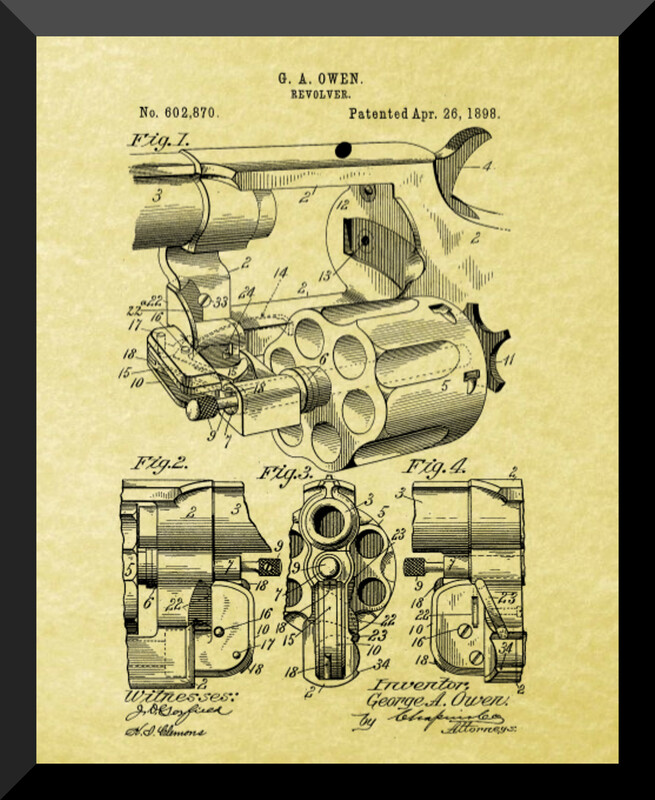 The goal of his invention was to improve the way shells were ejected and make it more convenient to reload the cylinder. Patent #2. 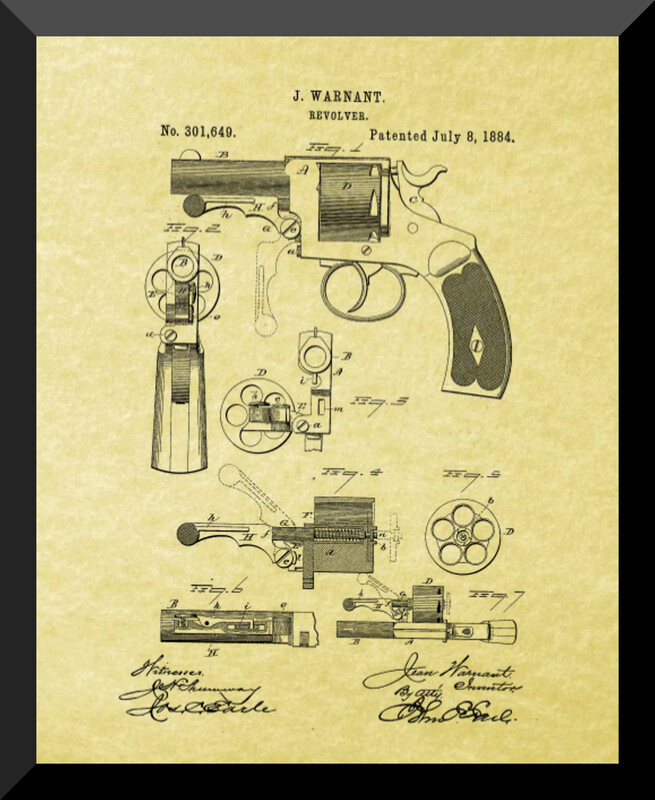 This patent was owned by Jean Warnant and filed July 8, 1884, and assigned to the famous Colt Manufacturing company, manufacturer of firearms since 1855. It was an improvement in the way bullets were injected into the gun and then ejected after being exploded. Patent #3. 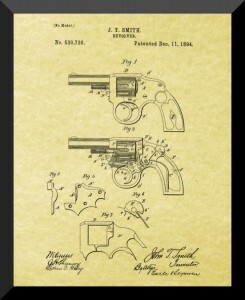 This patent was owned by John T. Smith and dated July 27, 1886. 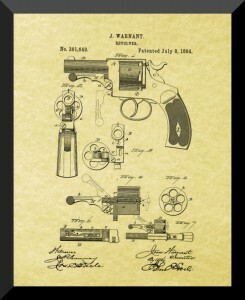 The object was to firmly hold the cylinder in place yet allow it to be more easily removed from the revolver. Patent #4. 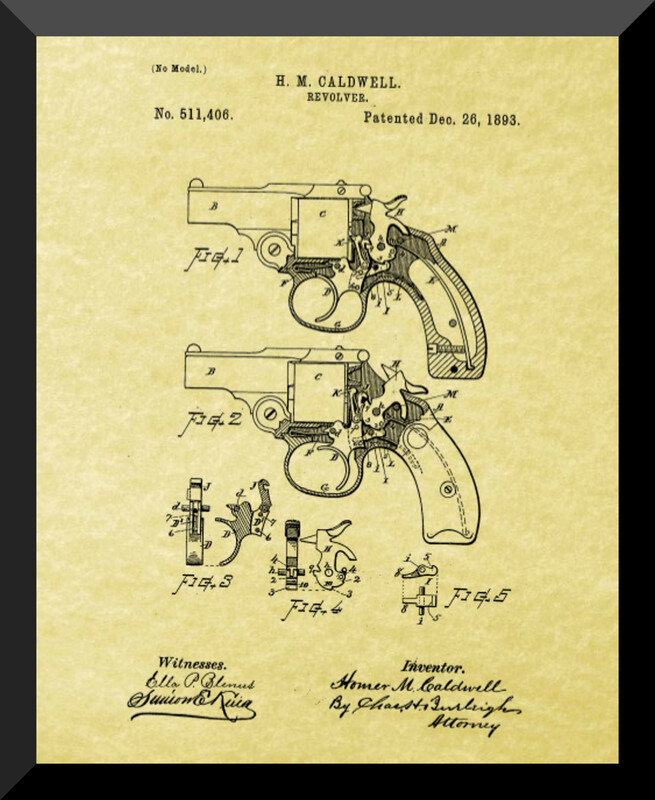 Patented December 26, 1893, by Homer M. Caldwell, and the object was to simplify the construction of the double-lock mechanism in revolvers. * Your patents will be printed on the highest quality glossy paper so they will be crisp and clear. * We use archival ink so your print will endure for generations. * The paper is 10.4 mil thick and can stand up to repeated handling. * There is no acid in the paper so your gun prints won't turn yellow or disintegrate. * The prints are 8" x 10" so are perfect for framing. * They will be shipped within 24 hours, excluding Sundays and holidays.